Several proteins and peptides can naturally assemble themselves into slender, long fibers known as fibrils and other shapes. Researchers have now discovered a method to harness this feature in order to develop tubular structures of diphenylalanine that are capable of converting thermal energy into electrical energy, also known as a pyroelectric effect. The results have been published in the recent issue of Applied Physics Letters, from AIP Publishing. The researchers explain that these nanoscale polymers, which are biocompatible, could comprise a variety of biological applications, including for miniature implantable sensors or drug delivery scaffolds. The team of researchers from Istanbul Technical University in Turkey, the University of Aveiro in Portugal, and Ural Federal University in Russia counted on diphenylalanine, a material earlier examined by the researchers for its unique physical and electromechanical properties. Drying drops of a solution of diphenylalanine results in peptide monomers developing elongated hollow tubes that are structurally the same as the insoluble fibers produced by Aβ -amyloid peptide in Alzheimer’s disease. Diphenylalanine is one of the first self-assembling organic materials that can be used to make microscopic tubes, rods, ribbons, spheres and more. In the presence of water, its chemical groups self-organize to make noncovalent bonds and form amazingly rigid, cytoskeleton-like structures. The researchers dried a standard peptide solution for one whole day under room temperature to permit diphenylalanine to gather into microtube structures, comprising individual tubes up to 1 mm long and 1 - 3 μm wide in diameter. The team further developed a number of microtubes in order to increase the current produced by the structures. These microtubes were placed between needle electrodes for measuring the properties of the structures. The structures were periodically heated with a laser, the temperature was modified to reach about 80°C and then the team calculated the pyroelectric coefficient, which refers to a measure of how effectively heat can be converted into electric energy by a material. Even though the pyroelectric capacity of the microtubes was initially changeable -- after being heated and cooled, the coefficient reduced by ~30% – they continued to be stable after the initial heating process. The authors suggest that the change could have occurred because heating resulted in disordering of the water molecules within the hollow tubes. This is the first observation of a significant pyroelectric effect in peptide microtubes similar to what’s seen with semiconductor materials such as zinc oxide or aluminum nitride. In principle, our peptide nanotubes can be used in the same manner as these materials for various applications. In earlier studies, the team demonstrated that nanotubes comprise piezoelectric effects, that is, they transform mechanical forces into electrical signals, and also have the potential to be used as sensors for pacemakers or various other small-scale electronic devices. 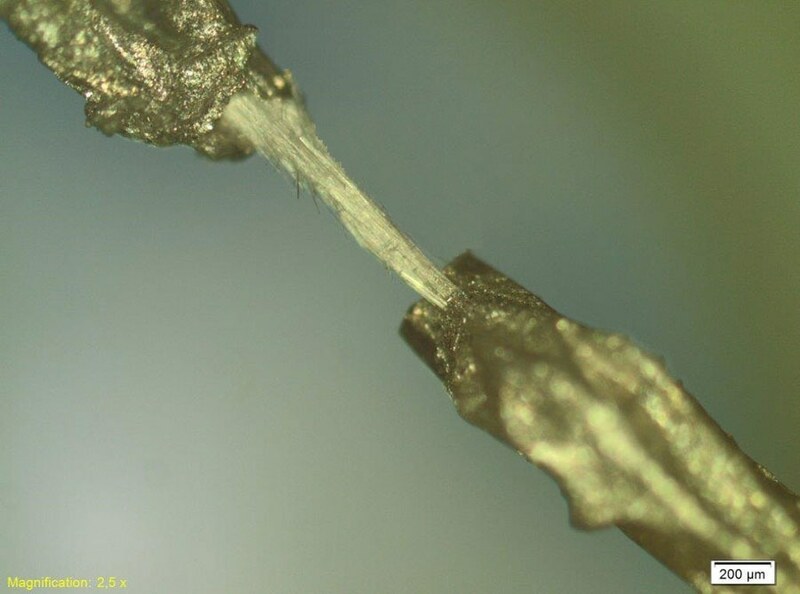 The newly identified pyroelectric properties will help expand the potential uses for diphenylalanine microtubes, stated Kholkin. For instance, the structures could be used to develop small-scale thermal energy harvesters, which could look out for energy lost in microelectronic devices. Their pyroelectric properties could also be used to engineer nanoscale and microscale thermometers that sense difference in temperature, rather than a cell’s absolute temperature.